James Hayes became a cadet officer Class II in the Hong Kong civil service in 1956. He was District Officer, South from 1957 to 1960 and Islands from 1961-1962. He then worked in a wide variety of government departments, his final post being Regional Secretary, New Territories, 1985 to 1987. James is also a scholar and author. He has written extensively about Hong Kong, especially its rural communities. He served as member, vice-president, and president of the Royal Asiatic Society between 1966 and 1989, and edited fourteen of its journals from 1967 to 1980. James Hayes: It may be helpful to draw attention to the Journal of the Hong Kong Branch of the Royal Asiatic Society, (http://www.royalasiaticsociety.org.hk) now entering its fifty-third annual issue, with which I am sure many of us are already familiar. This contains many topics of direct or related interest to subscribers in its pages. More to the point, the Journal and its contents are fully indexed, in two published indices for the first twenty issues up to and including 1980, and thereafter by an online index. Similarly, the Journals of the Hong Kong Archaeological and Hong Kong Anthropological Societies contain some useful information, though I am not sure whether they are indexed. Probably much less well-known is the late Professor Cornelius Osgood of Yale’s three volume work on Ap Lei Chau at Aberdeen (which he calls “Lung Chau”) published by the University of Arizona Press in 1966, under the title The Chinese, a Study of a Hong Kong Community. Osgood, a leading anthropologist of his day spent much time there in the early 1960s, and his detailed accounts of the community, and its businesses and manufacturies, present a wealth of detailed and well illustrated information, well suited to persons with our interests. This book has never received the attention, and acclamation, it deserves, and is well-worth seeking out. It includes, amongst much else, detailed descriptions of Incense Stick and Preserved Ginger factories on the former island. Curator of Anthropology at the Yale Peabody Museum, New Haven, Conn, USA from 1934 to 1973. I have made a few minor contributions myself in this line, in regard to incense manufacturing, charcoal burning, calendering, rope walks, indigo planting, blacksmithing, and the making of farming and fishing tools in the villages, also to bean curd and related manufacture, most of which can be found via the indices to the RAS Journal. My notes on these subjects were based on ground evidence, and the information provided by elderly persons in the Ap Lei Chau and Aberdeen area, and others in the villages of South Lantau from the late 1950s on. All told, they are a bit of a rag-bag, but are authentic as being assembled as opportunity offered on the spot and at times when very few enquiries were being made locally in these fields. 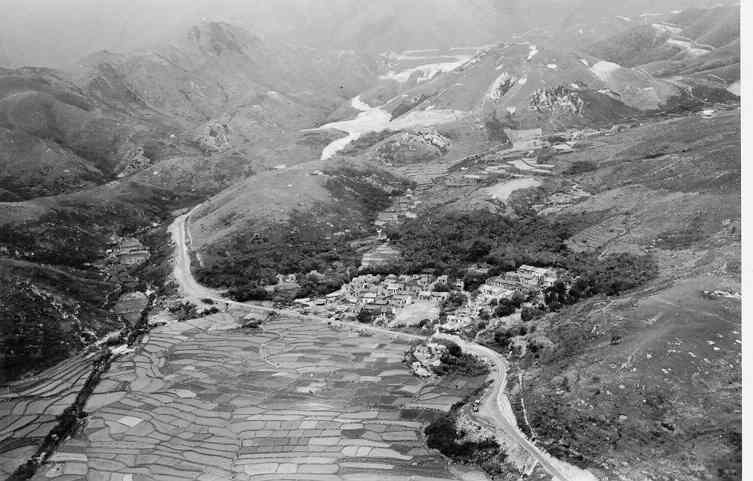 Shui Hau Village with its fields, and showing the South Lantau Road through to the Shek Pik Reservoir site, both then under construction, 1959-60. This recital reminds me that when my first book, The Hong Kong Region 1850-1911: Institutions and Leadership in Town and Countryside (Camden, Conn. Archon Books, 1977) was being reprinted in a paperback edition by Hong Kong University Press in 2012, I took the opportunity to add a new preface which records the work done on the ethnography of the region in the past fifty years, and lists published materials. Dependent on their interests, some readers may also find this useful. In conclusion, splendid background information relevant for the industrial history of Hong Kong is provided by Rudolf P.Hommel’s 1937 masterly compendium, China at Work, with its quaint sub-title, An Illustrated record of the Primitive Industries of China’s Masses, whose Life is Toil, and thus an Account of Chinese Civilization (New York, The John Day Company, for The Bucks County Historical Society, Doylestown, Pennsylvania, pp.x, 366). It was reprinted by the Massachusetts Institute of Technology (MIT) Press in, I think, the late 1970s.